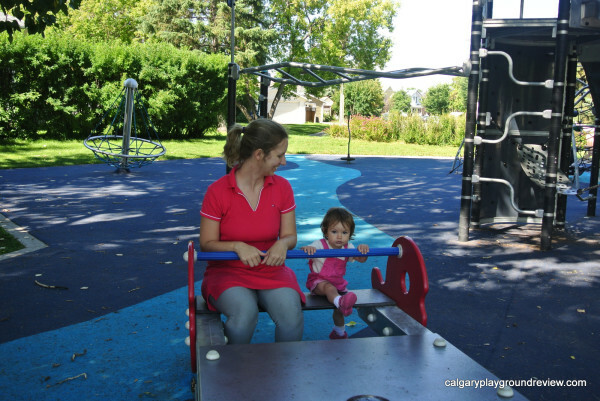 Gordie’s Review (18 months old – from our first review) – Walking over the ropes was fun! 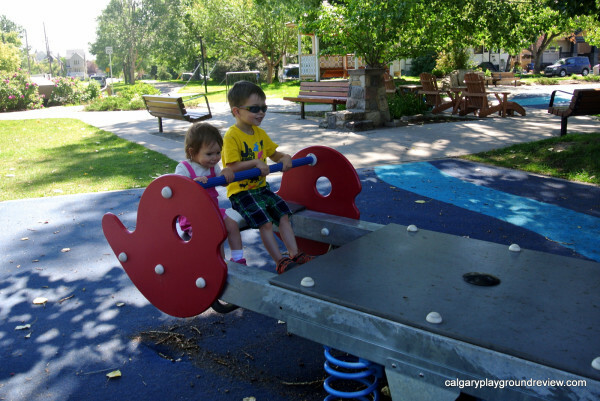 Gordie’s Review (4 years old) – Both spinners. 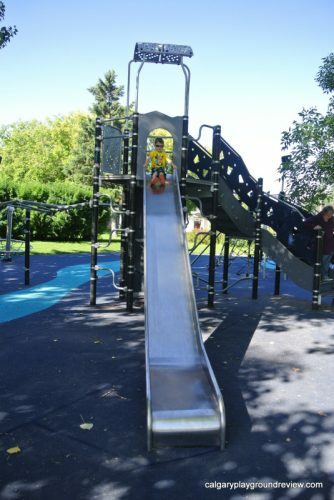 And the slide. 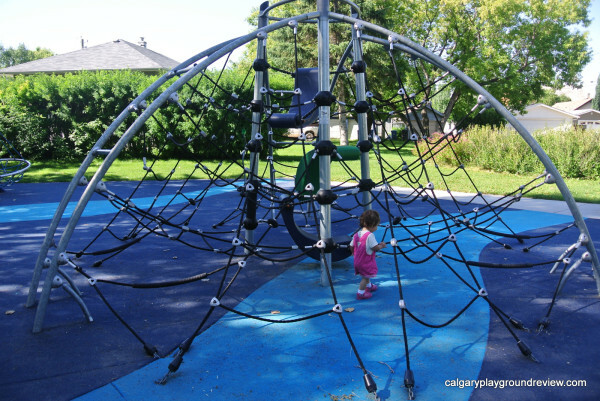 Nicky’s Review (16 months old) – Really liked the spinner. 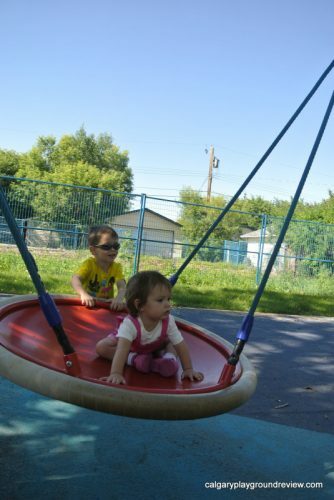 Features: Large school-aged climber; 2 large rope spinners (one with a base and cut out for better accessibility); large saucer swing; 3-D web climber; 1 person spinner; 4 person bouncer (low to the ground); small bowl spinner; Large ring spinner. 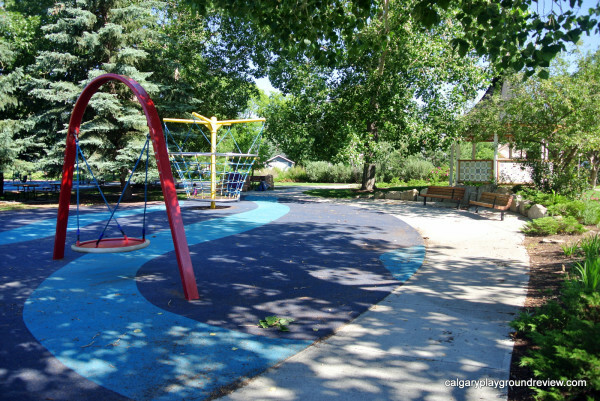 Surrounding Park Area: The playground takes up most of the space in this small park. 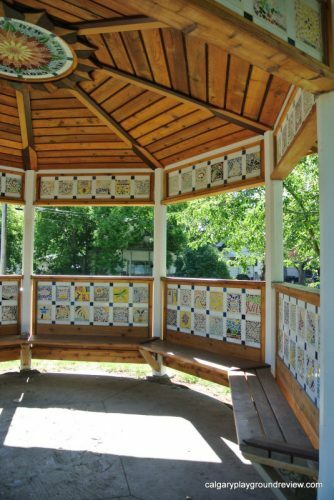 But with the trees, gazebo and all the seating it has a really lovely feel. 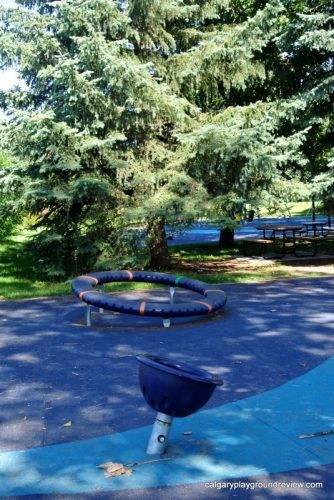 There is also a fountain with a dog bowl attached. 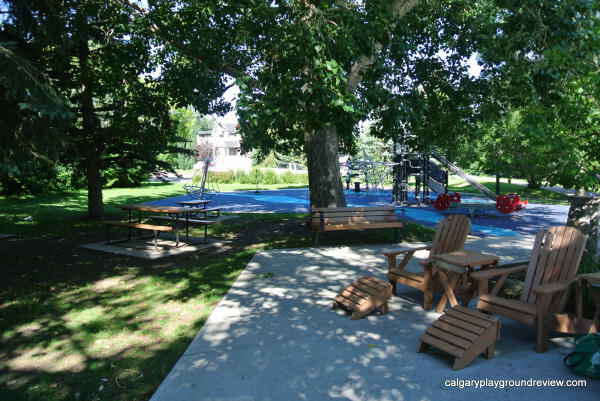 Shade: Mature trees provide great shade throughout the park. 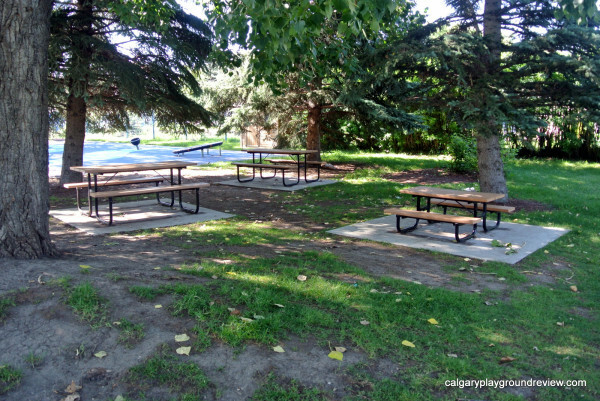 Seating: Variety of seating. 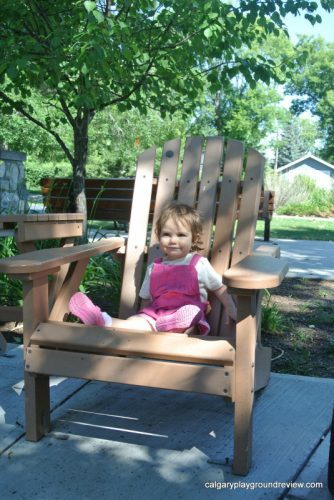 Adirondack chairs, picnic benches (even one child sized) and benches. 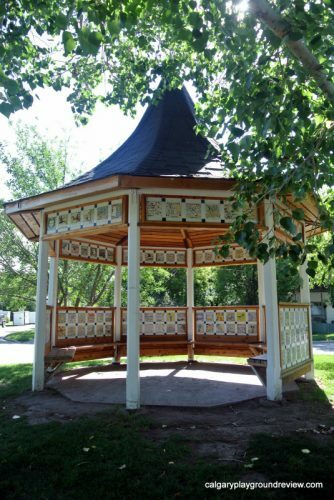 There are also benches in the inside of the gazebo. 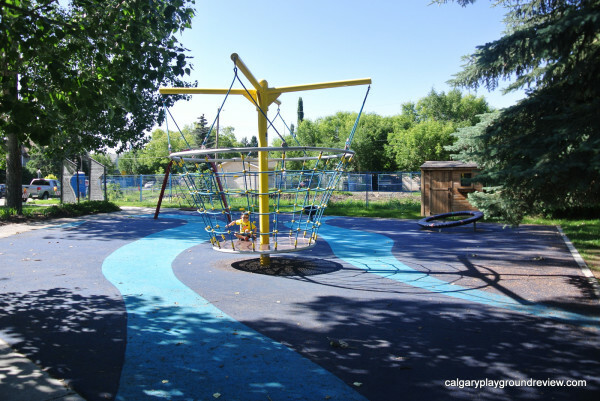 Accessibility: The ground floor of this playground is completely accessible. 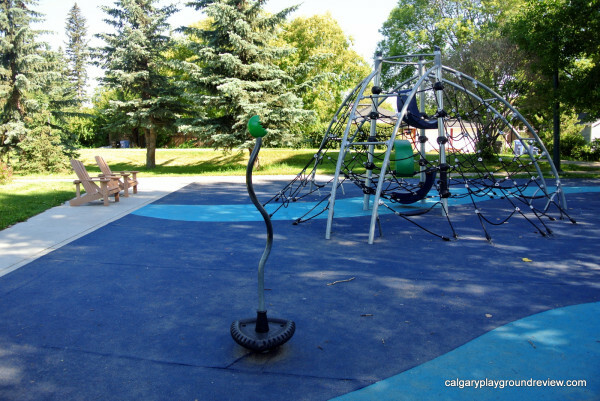 Although there is nothing that could be directly accessed from a wheelchair, you could get right up to the play on all items except for the tall play structure. There are also many items that could be accessed by people who could be transferred or just had low motor skills. 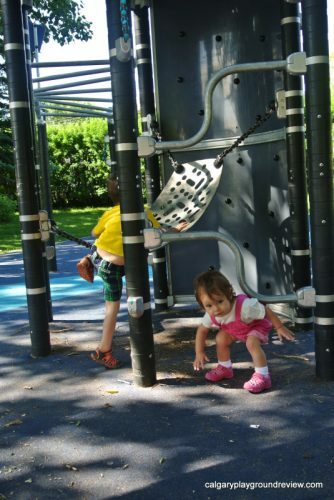 There are many things that swing, spin or bounce for children who benefit from those types of vestibular motion. 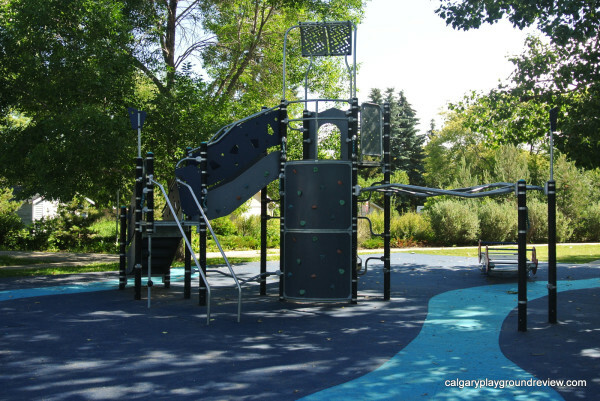 The large school-aged climber has stairs so older children with low motor skills could still get to the top. 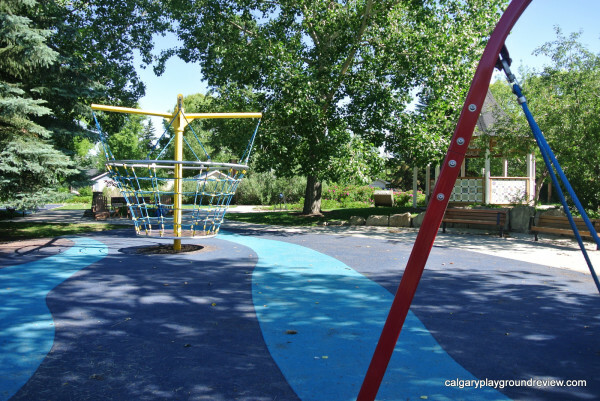 Overall Assessment: We first visited this park nearly 3 years ago and it is still one of my favorite Calgary playgrounds. One of the things I love about it is how the same equipment can be used by people of many different ages and ability levels. 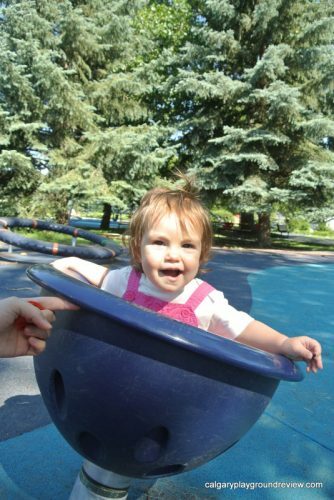 Nicky enjoyed being able to climb up onto the spinner, Gordie had great fun pushing it around and older kids would be able to climb around the ropes on the spinner while it spun. 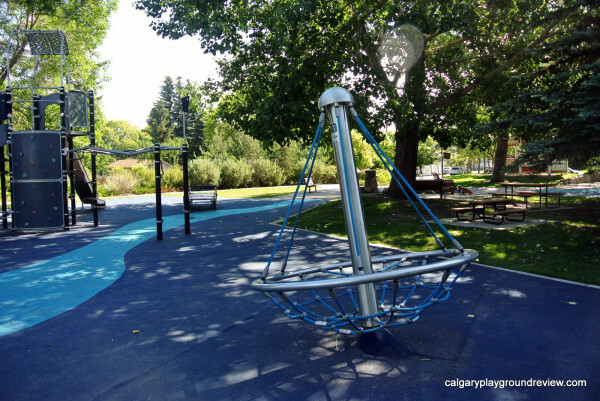 The park is more than just a place to watch your kids play, it has a real community feel with lots of seating great shade trees and accessible flooring throughout. 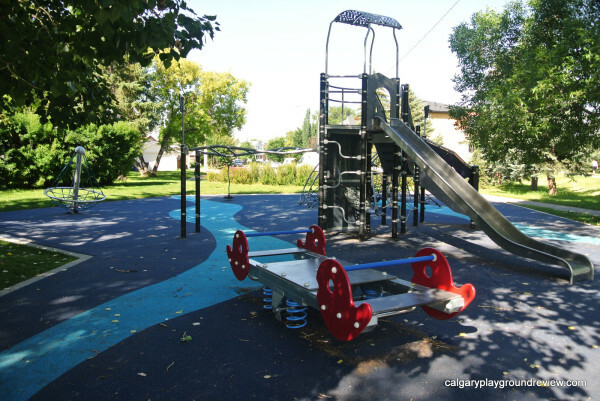 What a charming playground! I love all of the shaded areas. It was so shady! 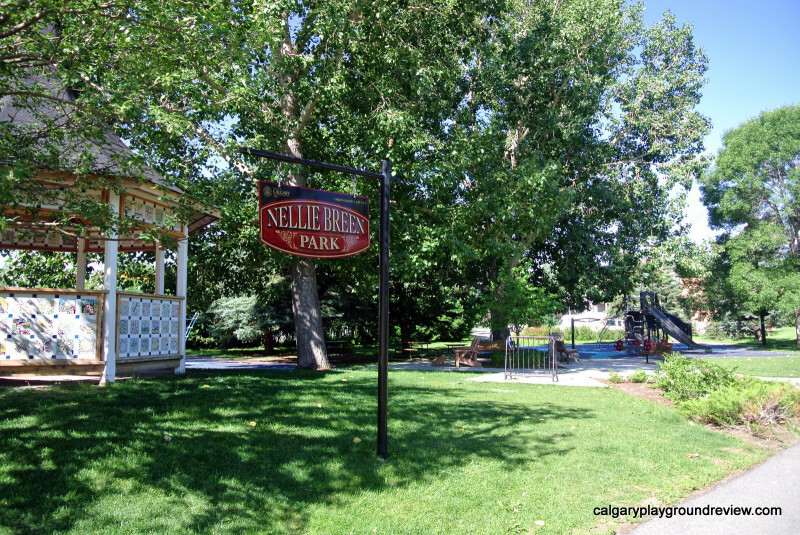 We were there in the morning and the whole area was shaded.